Hello. Matthew O’Reilly, Framer of Paintings, returning to the subject of Poedua, and particularly, her lovely frame. This is my second post about the conservation of the frame. The first one was in June, and it dealt with understanding the frame and its history well enough, and identifying the questions to be answered, before and so that, appropriate decisions could be made about the course of treatment of the dirty and damaged, but beautiful and historic frame. I have been kept from beginning the treatment until about a month ago, and have been working on it intermittently since. In my first post I noted a previous restoration on the outer sides of the frame, a regilding over a new layer of gesso and red bole. (Gesso: white chalk and rabbit skin glue; and bole: clay and rabbit skin glue — materials traditionally part of gilding systems on wooden furniture, frames, etc.) I had noted from the beginning, the use of “bronze” (which is actually brass!) paint here and there to cover damages to the gilding and gesso underneath, and noted further similar damages to the surface made since the use of the paint. I had noticed holes in the surface and in the wood on the back showing European woodworm attack (rather like borer-holes only a little larger in size). Since turning my attention back to the frame I have discovered that the front of the frame has largely all been regilded whether at the same time as the outer side regilding or on a separate occasion. One difference is that there is no additional gesso and bole layer on the carved details on the front, but signs of some partial regessoing on the flats. The best thing about not being regessoed is the retention of the detail in the carving, and most of the subtlety of form in the profile. 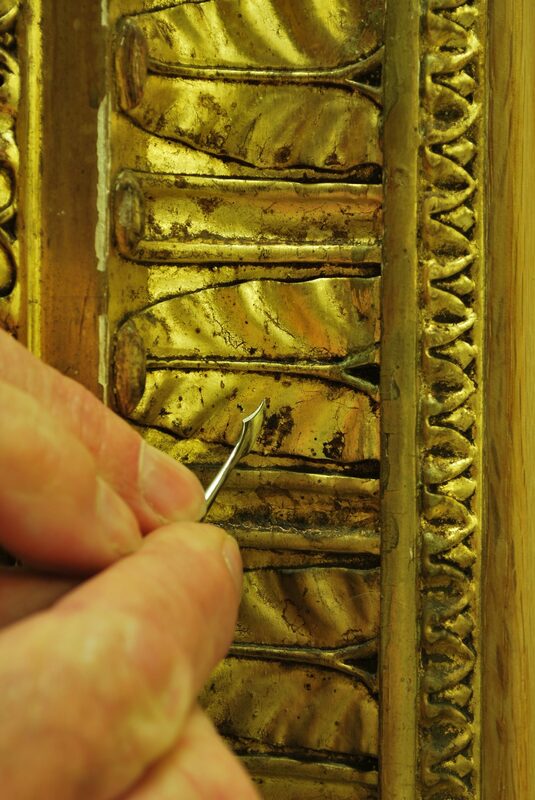 As has been shown quite frequently in examining older frames, the historical restoration involving regilding appears to have been a mixture of expediency (time spent = money spent) and the attention to respectful appearance (appropriate materials and technique). The front of the frame seems to have been regilded using the same methods as the original, as opposed to the far less subtle treatment of the forms on the outer facing surfaces. Later use of bronze paint to cover small damages is an example of still greater expediency with a poorer outcome: the paint also covers adjacent surfaces that were in otherwise reasonable condition, and the paint has gradually changed in colour to the very dull green that you can see here and there in the images below. In the interim, the decision was made to return the frame as best we could to a level of brightness (the virtue of its covering of gold leaf) commensurate with the return of the painting from its darkened state, by cleaning the surface appropriately, so that the painting and frame would present in a unified manner once back on exhibition. Given that the painting itself is becoming lighter as Katherine and Melanie find their way down to the original colour and tonality of the paint, as they remove the historical layers of dirt to reveal the painting closer to the intended appearance of John Webber, then it follows that the frame should also rediscover more of its earlier colour and tone. A frame importantly serves the aesthetic requirements of the painting it encloses as well as connecting it to the aesthetic requirements of the milieu in which it once resided. Indeed it is probably now the only evidence of that milieu. As you see from the earliest images of the frame the dirt was unevenly distributed across the frame. Bearing in mind that the frame is fairly big at about 1650 mm high, there was a graduated appearance from least dirty on the upper and high on the right members (i.e. brightest), to most on the lower member (i.e. 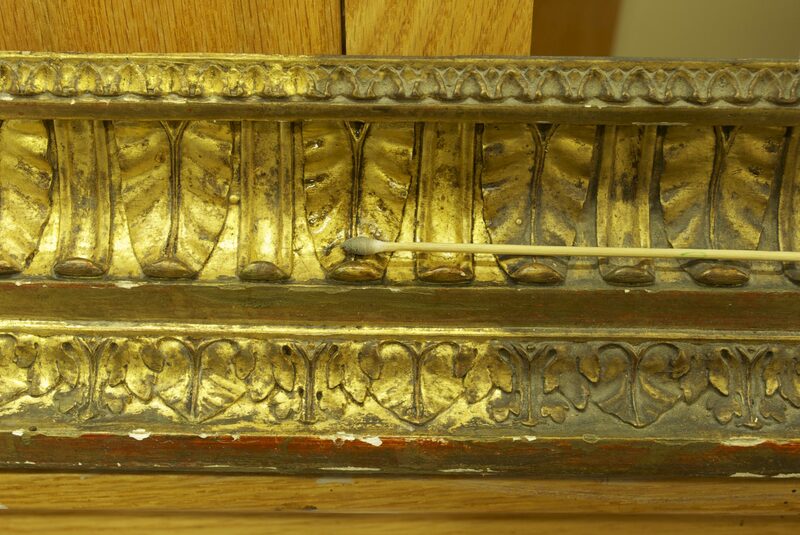 least visible gilding), and showing some difference in the amount of dirt also from right to left. I decided not to attempt a wholesale removal of the later regilding, since reasonably large areas of it, especially in the upper parts were in good condition, but rather to retain what was still good in it, and then to restore where necessary to a point of reintegration. It was first necessary to define the different methods of gilding utilised on the frame, in order to decide which cleaning material to use. The unadorned surfaces are all gilded using water gilding while the carved work is mostly gilded with oil size; the later regilding is consistent with the original in the techniques employed. I decided to clean the carved, oil-gilt parts first and it is this I am working on at present. So I have begun cleaning the grimy and often hardened sooty materials from the carved parts, discovering that the worst areas, mostly towards the lower section, have some damages that reach right through the various layers, with multiple interactions between the layers and the different materials of the original and later restoration additions and dirty surface depositions as far as the chalk or gesso, making an uncomplicated removal of the dirt impossible in many places. Lower member centre-right during swab cleaning. Photograph by Matthew O'Reilly. © Te Papa. I am using on the oil-gilt carved parts an acqueous cleaning agent applied with a cottonwool swab. This has shown to be effective in most parts but there have remained some more intractable areas of hardened deposits including flyspots, and places where the interaction through the surface layers mentioned above has left those layers physically and visually compromised. These parts have required some mechanical picking with a metal tool to smooth the degraded materials and remove the acretions sufficiently, so that when the reintegration is complete, the frame will once again present the painting acceptably. Left member centre, showing a typical area of surface damage. Photograph by Matthew O'Reilly. © Te Papa. Still to come: included in the visual reintegration of the frame surface will be the consolidation of various areas above the wooden carcase, particularly the gesso substrate where in some places the glue binder has broken down and is no longer holding well. This problem has apparently been suffered by the frame for a long period of time judging from the numerous small losses of surface material, which long ago gave rise to the use of the bronze paint, now green. And one of the corners will need to be disassembled and realigned, requiring in the process at least one other corner to come apart, before being put together again. But more of this aspect of the treatment in a later post.